Chapel Apartments Wales with its panoramic views of Carmarthen Bay specialises in weekend, and longer holidays for groups of up to 18 plus cots. If you have something to celebrate you should be here! Chapel Apartments is located midway between the Gower Peninsula, and Tenby overlooking Carmarthen Bay on the edge of the idyllic village of Llansaint with its two traditional welsh pubs, both doing great food, and Sky. The 17th Century stone chapel with its oak beams, and fabulous 7 feet circular stained glass window project a kaleidoscope of colures into the chapel. The apartments are deceptively large easily accommodating 18 guests to congregate or be seated in any of the three apartments. The Jolly Roger apartment on the first floor has the extra large dinning table which seats 18, and with three fully fitted kitchens to spread the load, catering for 18 is easy, and three washing machines. 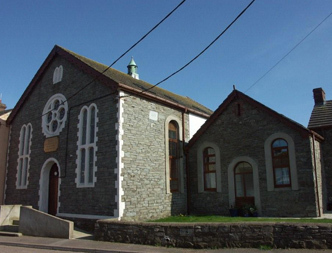 The chapel is one building with three independent apartments accessed from one entrance into the building, and then independently off a flight of stairs. No steps to gain access to the ground floor Admirals Rest apartment. You can lock all apartments independently for that extra security. Each apartment sleeps 6 guests plus a cot. We guarantee that everybody sleeps in a quality "FULL SIZE" bed with a deep fill Silent Night mattress. No sofa beds, No small beds, and No bunks at Chapel Apartments. We are 14 miles off Junction 48 of the M4 motorway making getting here a breeze especially for weekends. 1¼ hours from Bristol M4/M5. 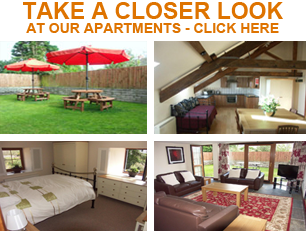 We can organise extra accommodation to facilitate larger groups. We appreciate the difficulty in organising groups to agree unilaterally. Please don´t hesitate to ask or to get the others in the group to ask questions. I am available on the phone most of the time, and I generally respond to emails within two hours. If there is anything we can do to help please let us know. 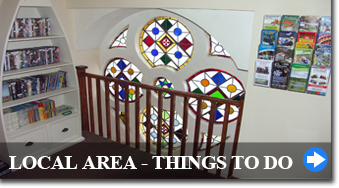 We have a comprehensive visitor information area, and local maps along with our DVD library located on the second floor with our 7 feet circular stained glass window. The "Wales Coastal Path" runs from Llansaint village across the meadows, through the forest, and over the hills to Ferryside. On the way you will wade through ankle high Blue Bells, Buttercups, Daisies, and a rainbow of wild flowers in April, May June, across winding streams, and ancient steps cut into the hill sides, and along the entire route you will stand in ore of the panoramic views of the Pembrokeshire coast line. A great place for photographers´ with some serious kit. Kidwelly Castel 1½ miles, Kidwelly Quay 3 miles, Ferryside small town 2½ miles, Pembrey Country Park 500 acres 5 miles, Dry Ski slope & Bobsleigh Ride 5 miles, Burry Port Harbour 6 miles, Millennium Coastal Path 5 miles, Celtic Trail ½ mile, Market town of Carmarthen 8 miles, National Botanic Garden Of Wales 9 miles, Gwili Steam Railway 11 miles, St Ishmael church 1100AD 2 miles, Beautiful walks from the village 0 miles, to the nearest pub 0 miles, Horse riding through Pembrey Forest, and on the beach 5 miles. 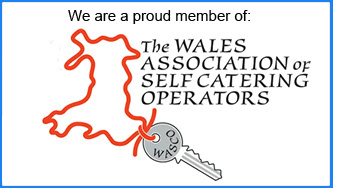 Carmarthen Bay Beach 1.5 miles beautiful walk, Ferryside Beach 2.5 miles, Pembrey Blue Flag Beach (Cefn Sidan) 5 miles. Pendine Sands 25 minutes drive. landed at our local Harbour in Burry Port on the 18th June 1928 after taking off a day earlier in Newfoundland America, and ensuring her place in history as being the first woman to fly across the Atlantic Ocean. There is a commemorative garden and plaque in Burry Port which is only 10 minuets away. 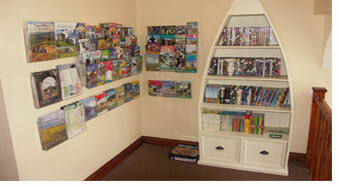 Please have a look at our attractions page, and apartment details. If you have any questions or concerns please phone or if you cant phone email. Thank you for your time and consideration, and we are all looking forward to welcoming you, and ensuring you take home endearing memories which will last a lifetime.